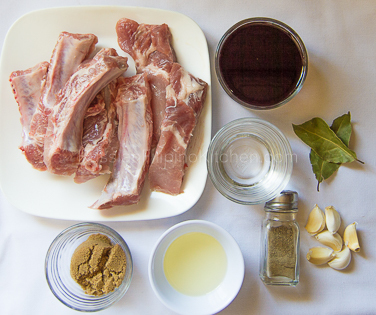 Hello guys, here is another family favorite that I will share with you today—pork ribs adobo. 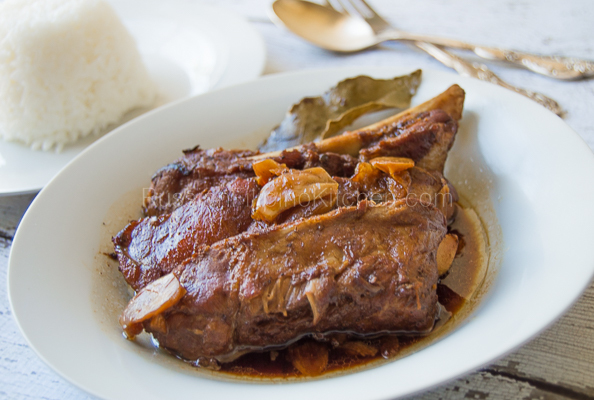 This dish, along with other variations of adobo, is popular in the Philippines. 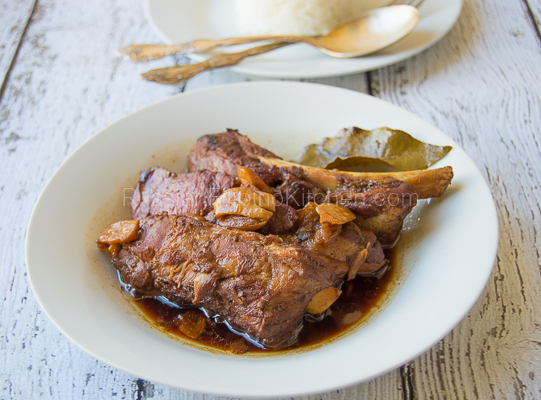 Regular pork adobo is delicious but pork ribs adobo is much tastier owing to the extra flavor from the bones. You should give this a try. Filipinos are known for our “adobo” recipes which are meat or vegetables cooked in soy sauce, vinegar, garlic and some spices. Every family has their own version depending on preferences and palate. 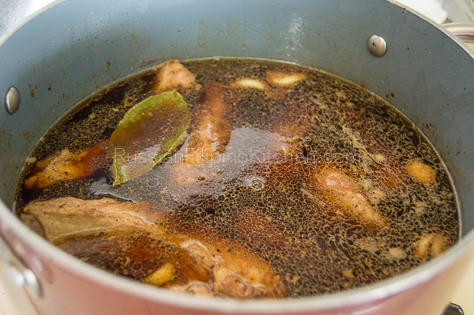 When it comes to cooking adobo, the ratio of soy sauce and vinegar determines how salty or sour the finished product will be. 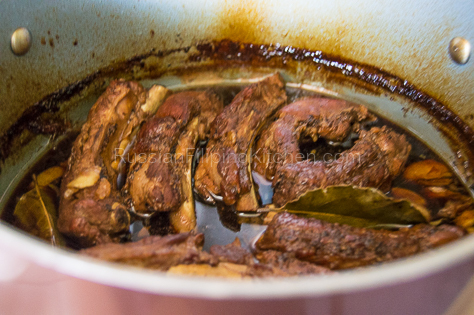 I like my adobo cooked like “humba” Bisaya-style with the addition of brown sugar for a little hint of sweetness to offset the saltiness from the soy sauce and the tartness from the vinegar. *Note: you can let most of the sauce to dry up or have a lot more to drizzle on your rice. It’s up to you. 1. Crush garlic cloves with the flat side of your knife to loosen the skin. Peel and set aside. 2. Heat a 5-quart Dutch oven or cooking pot over medium high heat then add the oil. 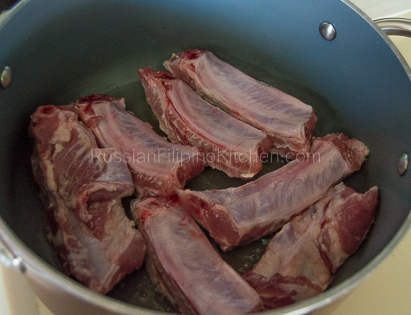 Brown pork ribs about 5 minutes per side. 3. Throw in crushed garlic and saute till lightly brown and fragrant. 4. Throw in the rest of the ingredients into the pot: soy sauce, vinegar, water, bay leaves, brown sugar, and ground black pepper. Stir to mix. 5. Bring pot to boil, then turn down heat to medium low. Simmer uncovered for 1 hour until the meat is tender and sauce has reduced. 6. Remove from heat and serve with warm boiled rice. 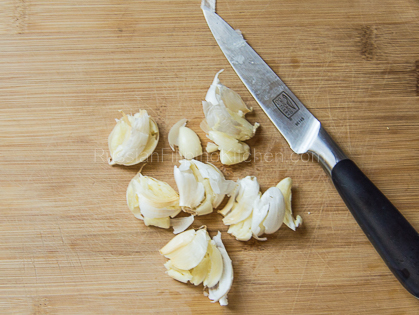 Crush garlic cloves with the flat side of your knife to loosen the skin. Peel and set aside. Heat a 5-quart Dutch oven or cooking pot over medium high heat then add the oil. Brown pork ribs about 5 minutes per side. 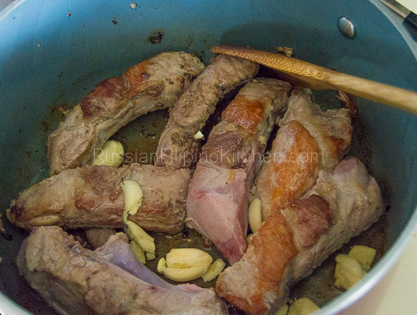 Throw in crushed garlic and saute till lightly brown and fragrant. 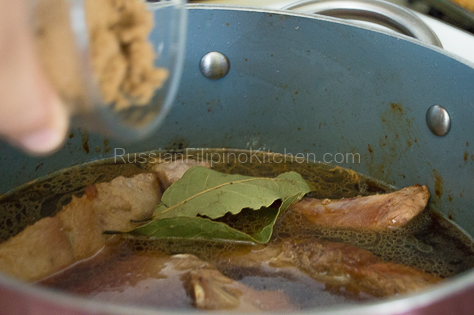 Throw in the rest of the ingredients into the pot: soy sauce, vinegar, water, bay leaves, brown sugar, and ground black pepper. Stir to mix. Bring pot to boil, then turn down heat to medium low. Simmer uncovered for 1 hour until the meat is tender and sauce has reduced. Remove from heat and serve with warm boiled rice.